Sharp Sans Display No.1 is geometric display sans-serif inspired by Herb Lubalin’s original photo-lettering for Avant Garde magazine. Lubalin himself had a mastery of letterforms, which was more cerebral than bodily; an idea man whose typeface designs and loosely jotted, but ingenious sketches of compositions would find their ideal execution by the hands of such greats as Tony DiSpigna, the unflinchingly precise Tom Canarsie, and the legendarily prolific extra-bold, italicized Ed Benguiat. The best examples of these works display a mastery of clean typographic form that pushed the boundaries of contrast, proportion, and construction into previously uncharted territories. The Avant Garde typeface was not originally conceived as a digital typeface for mass distribution. Its original design was singularly uppercase, and strictly for the context of the Avant Garde magazine. Its innovation was its system of interlocking ligatures, its tight-as-humanly-legible spacing, and its relentlessly geometric design (the latter of the two being the greatest source of inspiration in the conception of Sharp Sans Display). Digital editions of ITC Avant Garde Gothic are readily available, but interestingly it is two of its original creators who would advise most enthusiastically against its use. Tony DiSpigna once said, “The first time Avant Garde was used was one of the few times it was used correctly. It has become the most abused typeface in the world.” Ed Benguiat has stated that “The only place Avant Garde looks good is in the words AVANT GARDE.” In our opinion, the beautiful instances that made the Avant Garde magazine lettering so compelling had not yet been properly translated into a quality digital typeface. Sharp Sans wasn’t meant to be that exactly, but the capitals in Sharp Sans Display No.2 are definitely a direct homage. While Sharp Sans Display No.1 ends its round monolines with diagonally sheared terminals, Sharp Sans Display No.2 shears those terminals on a 90° angle. This small distinction allowed us to create two unique but interconnected font families. 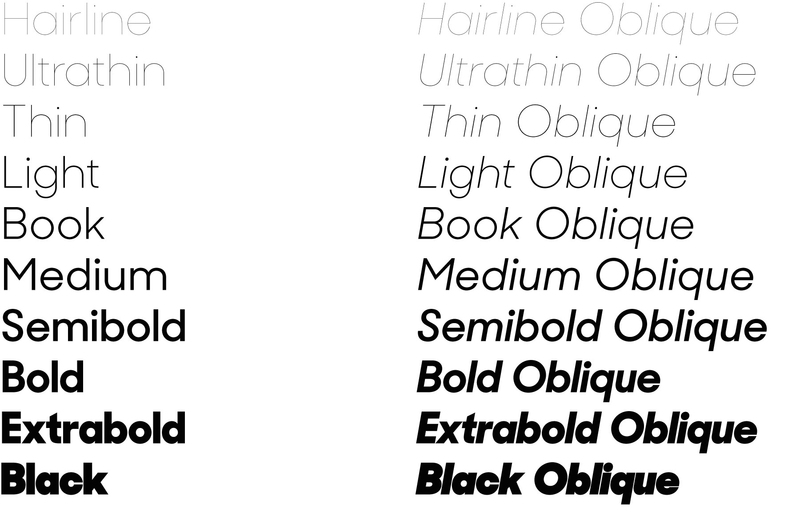 Sharp Sans Display No.2, being the more geometric of the Superset pair, has a more traditional oblique for its italic, as well as alternative reductionist Herbert Bayer-inspired lowercase. Sharp Sans Display No.2 also has the first truly fluid OpenType homage to the famous Avant Garde interlocking capital style created out of an intelligent system of ligatures and contextual alternates which do not interfere with tracking (we suggest you track them in). Sharp Sans Display No.2, being the more geometric of the two displays, has a more traditional oblique for its italic, as well as an alternative reductionist Herbert Bayer-inspired lowercase. Sharp Sans Display No.2 also has the first truly fluid OpenType homage to the famous Avant Garde interlocking capital style created out of an intelligent system of ligatures and contextual alternates which do not interfere with tracking (we suggest you track them in). Sharp Sans Display No.2 designed by Lucas Sharp in 2012 with Andrew Kent. Sharp Sans No. 2 is available in 10 feature-rich weights in Roman and Italic with built-in small caps & swash alternates.